The Australia skipper was candid enough to acknowledge the top-class show by the Indian bowling attack. 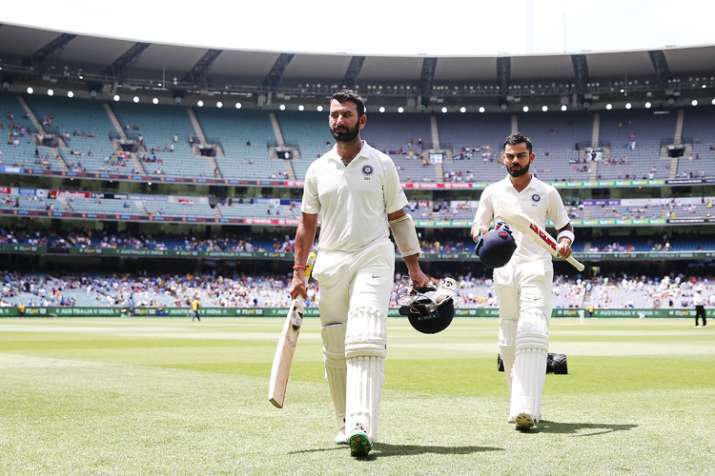 Pujara and Kohli built a solid foundation during India's first innings in Melbourne. Comprehensively beaten by India at the MCG to concede a Test series lead, Australia skipper Tim Paine Sunday admitted his batsmen failed to cope with the high-quality opposition bowling attack in the absence of banned Steve Smith and David Warner. India beat Australia by 137 runs in the third Test to go 2-1 up in the four-match series and take giant strides towards winning their first ever Test series on Australian soil in seven decades. But Paine sought to explain the defeat to the team's inexperience in the absence of Smith and Warner who were banned, along with Cameron Bancroft, for their involvement in the ball-tampering scandal in the Cape Town Test earlier this year. Bancroft's ban period ended on Saturday while Smith and Warner will have to wait till March end. "It is inexperience. It is pressure. India's bowling attack being probably as good as probably most of these guys have ever faced. It is pretty clear, if you take 2 or 3 of the best players out of anyone's lineup in the world, you're going to struggle a little bit at times and have inconsistent performances. That's what we are seeing," Paine said at the post-match press conference. "In Perth, on a really tough wicket, our top six dug in and had a real crack. In this game, no doubt we were a little bit disappointing. That's going to happen from time to time. We have to make sure we're improving and our good and our bad is a little bit closer together than what it has been in the last couple of Tests. But I think it's pretty common when you've got inexperienced players in your top six against high-quality bowling." Paine said India had two world-class batsmen in Cheteshwar Pujara and Virat Kohli who anchored the innings to a 400-plus score, while Australia were missing Smith and Warner. "If you took Pujara and Virat out of India's side I think you would have the same conversation. If you have got world-class players that are not in your team, are they going to add to our team? I think they will. So while at the moment it's challenging and everyone's frustrated, it is what it is and everyone is working hard and we're getting guys who are getting the experience of high-pressure situations in Test cricket and learning on the job. "At times you're going to get inconsistency from guys that are in that situation. The silver lining is that we have got world-class players that are available soon to come back into this side and clearly when they do it will make a huge difference," he added. "Their pace bowling, in particular, has been incredibly disciplined and has worn guys down. That is a factor why we are having a lot of starts because they are just bowling really well and making it really hard to score. They grind you down and force you to make a mistake. "There's a little bit from our side, but you've also got to give them a huge amount of credit for the way they've been bowling as a group in this series and probably the last 12 months," Paine said. Paine lamented Australia lost a chance to restrict India in the first innings and allowed them to declare on 443 for 7, and his side were always chasing the game thereafter. "India batted superbly in the 1st innings, from that moment we were behind the game. We knew the wicket was going to deteriorate and it was going to be hard work against their disciplined attack. We'd like to get to Sydney, win the toss and have the same thing reversed," said Paine. Talking about the MCG pitch, he said, "The wicket was always going to be a bit of a grind. It was going to be slow and at times expose a bit of a gap between sides. They won the toss, batted really well and kept us out there for two days. After that we were behind the eight ball, it's pretty hard to come back from that. I think plain and simple, we were outplayed and India deserved to win this Test. You have to give India credit." Australia have a few selection headaches ahead of the Sydney Test that starts on January 3, with Aaron Finch, Peter Handscomb and Mitchell Marsh, all out of form. Leg spin all-rounder Marnus Labuschagne has been called up, with Paine claiming that a spin-friendly pitch is on the cards. "Marnus has been added to the squad, he'll come with us to Sydney and have a look at the conditions. I think we're hearing it will spin quite a bit, so once we see that for ourselves we can try to think about the best combination to win that Test. "That's the goal for us, to win the Test and draw the series. I think there will be a lot of things on the table in the next day or two and I've got some thoughts on what I think. We've got the best group of players available to us at the moment and we'll pick the best combination out of that group that we think will win this last Test." He asserted that irrespective of how the series is placed, the Australian batsmen are desperate to score a few more runs in order to prevent a 3-1 series scoreline. "The batsmen would like to be scoring a few more runs but at the same time what we've seen is guys are getting starts. They're seeing they're good enough at this level, it's just a little bit of a mind thing to really believe they belong at Test level," Paine signed off.